It’s the dream of a lot of college graduates – get a good job and save to buy a home. But a lot of college graduates also have student loan debt, and this debt could prevent them from buying a house. That makes it tough to qualify for buying a house. While a student loan, by itself, won’t hurt your ability to get a mortgage, in combination with other factors, it really could prevent you from getting your dream home. Here’s what you need to know about your student loans and buying a house. In order to qualify for a mortgage, you need a few financial things in order. Credit Score: First, you need a solid credit score. To get the best mortgage rates, you typically need to be above 750. But to even qualify for a mortgage you typically need to be above 650. One of the biggest things that impacts your credit score is your payment history. Since you have student loans, you MUST make all your payments on time. This will impact your score greatly if you don’t. If you don’t know your score, use a free service like Credit Karma to check. Debt to Income Ratio: Next, you need a good debt to income ratio. This means, your mortgage payment should not exceed 30% of your income, and your TOTAL debt payments (including student loans), shouldn’t exceed 50% of your income. If you currently pay $200 per month on your student loan debt, and you want to get a mortgage that will cost $1,500 per month, your total debt payment is $1,700. That means your monthly income should be greater than $3,400 per month – or $40,800 per year. Remember, this is really to protect you, because you need to have extra cash each month to pay your other expenses. Understand everything you need to know about your debt to income ratio and student loans here. Assets: Finally, you need to have assets. You need to have enough money to make a down payment (typically 20%, but as little as 3% with certain types of loans). You also need to show that you’ll still have money after you pay the downpayment. Banks typically want to see at least 6 months of reserves – proving that even if you lost your job, you could still pay your mortgage. Student loan debt just adds to the amount of assets you need to show proof of. Now that you know what it takes to get a mortgage, you need to understand how a student loan can hurt you. Not Making Payments: If you don’t make, or even if you just miss a couple, student loan payments, you’re not going to be able to qualify for a mortgage for a long time. It will take years to repair your credit score, so simply make all of your payments on time. If you are having trouble making payments, switch repayment plans or consider getting a deferment if you qualify. 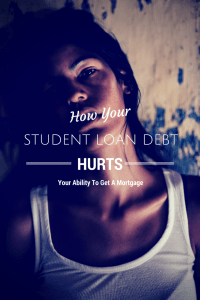 Having Too Much Debt: If you have too much debt (both student loan debt and regular debt combined), you won’t be able to qualify for a mortgage. In this case, you either need to earn more money, or pay down your debt. Doing both of these actions will improve your debt to income ratio, and improve the likelihood that you’ll qualify for a mortgage. Being On An Income Based Repayment Plan: If you have to change your repayment plan to an income-based repayment plan like IBR or PAYE, chances are you’re not going to qualify for a mortgage. We cover it in more detail here, but basically, your lender doesn’t report the amount you actually pay as your minimum payment, but rather, they report your payment under the standard repayment plan. So, if you qualify for $0 monthly payments, but your standard repayment amount should be $200, $200 is what shows up on your credit report and it’s what lenders use to calculate your debt to income ratio. It can be hard to shop around for a mortgage. We love using these online mortgage lenders because you can do most of the process online without ever talking to someone (which I prefer). However, they don’t always have the best rates and fees, and if you don’t have a simple situation, their software might not work for you. The key to getting a mortgage when you have student loan debt is to educate yourself and protect yourself. First, you need to know your credit score so that you can figure out what you’ll qualify for. Use a service like Credit Karma to find out what your score is. Next, you need to make sure that your credit report is accurate. When you use Credit Karma, look at all of your accounts and make sure that they are correct. If they aren’t, you need to dispute the issue and get it fixed. This should help raise your score so that you can qualify. Finally, don’t get discouraged – shopping around can be hard, and so can dealing with your student loan debt. When we looked at mortgages, the student loans never came up. Instead, it was more about the debt to income ratio.